Joey Gallo has put Myrtle Beach in his rearview mirror, but the Carolina League still hasn't shaken the impression he left. On Thursday, the league announced that the Rangers' top prospect had been voted the Most Valuable Player, despite graduating up to Double-A in early June. The league also named Wilmington right-hander Glenn Sparkman the Pitcher of the Year and Potomac's Tripp Keister the Manager of the Year. Gallo erupted onto the prospect scene in 2013 with Class A Hickory, becoming the first teenager since 1962 to club 40-plus homers in a season. He also struck out 165 times in 106 games and hit just .245 with the Crawdads. 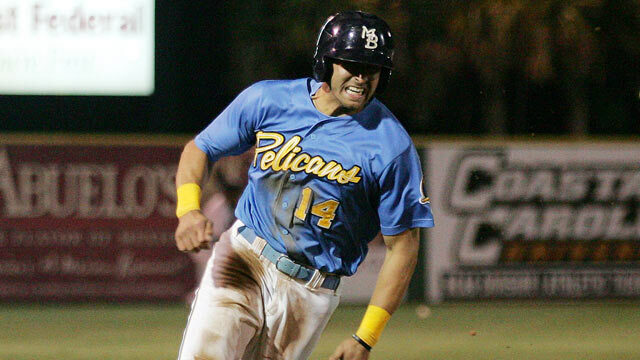 The third baseman's prodigious power translated easily to the Carolina League, as he popped 21 homers in 58 games with a .735 slugging percentage. The rest of his offensive game developed sharply with the Pelicans, though. He struck out just 64 times in 58 games, posting a .323 average and a 1.199 OPS. Gallo went on to Double-A Frisco, where he's added another 20 homers to his resume, giving him 41 roundtrippers on the season -- a new career high. Sparkman will take home the Pitcher of the Year hardware after failing to make the Wilmington rotation out of Spring Training. The 22-year-old's first 11 appearances came out of the bullpen, but he transitioned to the rotation in late May and never looked back. Sparkman began his rotation stint with 18 2/3 consecutive scoreless innings and has held opponents without an earned run in eight of his 17 starts. Overall, the Royals prospect has a 1.40 ERA in 116 innings, striking out 113 and walking 22. The 2013 second-rounder now boasts a 1.47 career ERA in 152 2/3 innings. Gallo is joined on the Carolina League All-Star roster by fellow Myrtle Beach position players Jorge Alfaro, Nick Williams and Chris Garia -- Alfaro and Williams have also already jumped to Double-A. The White Sox' No. 5 prospect Courtney Hawkins also earned an All-Star nod. The 2012 first-rounder (13th overall) was repeating the level and made drastic improvements in his batting average and on-base ability while matching his '13 output with 19 home runs.